This is a trendy style red suede leather coat for women which is crafted from suede leather and featured with a pointed collar of lambskin leather. 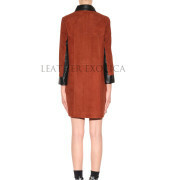 It has long sleeves with black lamb leather cuffs at hem. It is a paneled style women leather coat which has side pockets and front zipper closure. Also suede leather coat for women it is fully lined and available in all sizes.